Best Jeans Outfit Ideas for women over 50: One piece of clothing that can easily be found in every wardrobe is a basic pair of jeans. They are an essential part of our everyday looks and can be styled in multiple ways. One reason to own a pair of Jeans is the number of times it can be repeated without making it too obvious. Create an uber chic outfit by throwing in a trendy top, sweater or jacket. 2018 has been all about patches, ripped jeans, pearl embellishments, and what not? Apart from being one hit of the year, jeans are easy and comfortable to carry. Women that prefer great fitting can opt for Slim fitted Jeans while those seeking comfort can opt for the Mom Jeans. They can be paired with Boots, Trainers, Heels and even Sandals depending upon the occasion, season or time of the day. 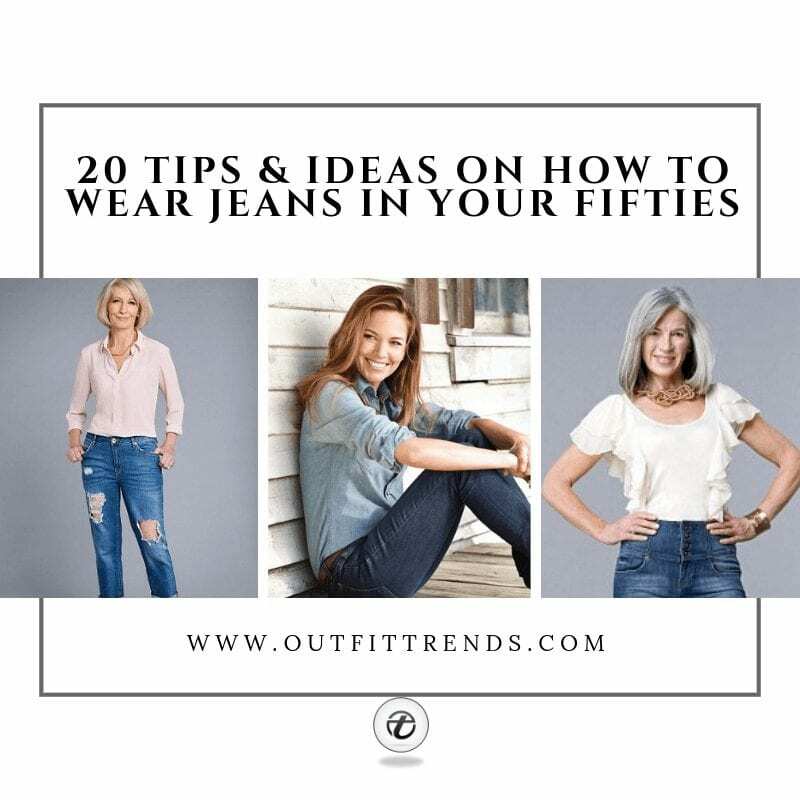 How to Style Jeans for 50 Plus Women? Despite being a very simple piece of clothing, women tend to go wrong in trying to style their everyday outfits. If you plan on going the ripped way, ensure that you are not baring too much of skin. Do not pair your Baggy Jeans with Boots. The two do not mingle together. Wear the right size. If you happen to fit in two sizes, opt for the smaller one. A smaller size that fits like a glove can help enhance the curves. Go for a medium wash if you plan on wearing neutral colored shirts. A black or gray Denim wash is great for a more sober look. Get dressed for Summer in the best way possible. A perfect pair of denim jeans and a funky top can go a long way. Being middle-aged does not mean the fun should stop, right? Summers are all about staying cool and what better way than a bright colored top? We love how Suzi does it with her hairband each time. The folded cuffs compliment her entire look well. Here are 30 Best Summer Travelling Outfits for Women Over 50. Suzi brings her fun side forward with a funky top featuring pops of colors apt for the Summers. The front knot, ripped jeans, sunglasses and similar colored Bow are all adding up to the funkiness. Who says middle-aged women cannot have some fun? Her Denim jeans are doing great at toning down the splash of colors and neutralizing it perfectly. We have talked about this before and cannot stress on it enough. Ripped and distressed are widely popular and do not seem to be going out of fashion any time soon. Now would be a great time to invest in one. Though, it is important to note that a ripped jean does not mean completely exposing the knee or the thigh. Mere glimpses of them are great and also give a decent look. Layers are one of the easiest looks to achieve with a simple pair of Jeans. They give the best of both the worlds. Pull over a sweater or a Shirt over another top, and you are good to go. For people living in colder climates, the look can help keep you both stylish and warm. The look in the picture below is a great one to take inspiration from. It involves wearing a Black U or V-Neck Sweater over a collared shirt. The monochrome look is great for women that prefer dull and neutral shades instead of brighter ones. Fun should not be limited to the Summer Breeze, and so we bring you an achievable look that is great to spice things up while also staying warm. Layers of Sweaters, Jackets, Scarves, and Hats easily overshadow a good pair of jeans. However, a denim pant can also play a neutral tone to let the winter clothes do the talking. Jeans are, anyway, great for the Winters as they help one stay completely covered and protects from the cool breeze. This baggy pair of Jeans sported by Sarah Jane Adams is Unconventional, but we sure love it on her. A statement pant is a great way to prevent the winter clothes from overshadowing jeans. Also, have a look at these 30 Best Winter Travelling Outfits for Women Over 50. Here’s some more inspiration from her as she wears her hoodie over her cap and keeps both Winter Fashion and Warmth in check. ↓ 16. Not my Business! We wonder why Jeans cannot be made an official part of Business Formal Attire; life would have been much easier that way. Besides, who would not love finding an excuse to buy an extra pair of jeans, right? It is not quite often that we see Women spotted in Men’s wear. Though if it were up to us, you would only see us shopping from outlets dedicated to Men’s fashion. Oversized blazers, Men’s Shoes, and Ties somehow look even better when worn by women. We recently found Mel Kobayashi sporting a Blazer found from the Men’s section at H&M and could not help but admire her. The entire look is very Business Casual and is perfect for days when you want to seem both Professional and laid back. Of course, you have heard of Denim on Denim, but here is a Dripping Denim look, as Lyn Slater puts it. Why sport the 80’s denim look if you cannot go head-to-toe in denim? An over-sized jacket and boot-leg pant are the perfect combinations if you ask us. Though wearing a similar outfit for your everyday look would not be as comfortable as Lyn makes it look, but a simpler version can be easy to pull off. This one happens to be an important one. For someone who is curvy yet short, finding the right pair of Jeans is nothing short of a nightmare. If it fits well, it ends up being too long, while the right length just never fits. In a case like that, the easiest way out is to pick the former option. Fixing a pant that long involves either a visit to the tailor that often does not go too well or just simply folding the cuffs for an added style element. Lace-up shirts were recently made popular when some celebrities were spotted wearing them. From Kardashian-Jenner’s to Hadid’s, they have all been spotted following the trend. The style is unique, hot and do-able. A plain lace-up shirt is great for a casual day out with friends. The outfit also does not need a lot of accessories as the lace does the job instead. We love how Beth styles it only with a pair of sunglasses to make it appear very laid back and casual. Jeans are a great way to cover up during the Winters and when paired with a long coat, can work well together. This Burgundy Long Coat is the colour of our Fall Dreams and looks well with basic denim jeans. The addition of an animal print scarf is a great one to complete her Fall/Winter look. Lastly, the leather bag acts as the cherry on top. The look is perfect for an evening stroll out in November or December. Since there is something for every season, how about flowers for Spring? The best way to ring in Spring is with floral prints. This simple yet classy cardigan is great to pull over when you want to do more than just Black with Jeans. It adds just the right tinge of pink to her overall neutral outfit. Lastly, the pink suede heels seem to be complimenting her cardigan and are a great hit. One of the most basic, yet repetitive fashion trend is that of the Polka Dots. Whether on Apparel or Accessories, the trend seems to never die down. The 80’s trend was recently made popular when they were spotted on the runway again. If floral prints do not seem to impress you too much, polka dots are for you. They are a great way to move on from simple printless shirts and also for those that prefer smaller prints. This monochrome top seems to be perfect for this blue denim wash. Here are 10 Most Productive Hobbies for Women Over 50. Denim Jeans are great until you grow out of the blue trend and are stuck between choosing the right top for them. We have found a great solution to the universal problem. You either go for block colors or you jump right into a pool of them. This striped top, as seen on Dorrie, is a great way to defy all fashion norms when it comes to picking the right color for your denim bottom. Moreover, we are loving the statement sleeves that are making her arms appear longer. Fringes keep coming and going out of fashion like no big deal but they have been spotted quite a few times. The key is to keep the look minimal to highlight them. Here is one of our favorite outfits featuring them. The mustard leopard top and fringes go well with basic jeans making it a great travel outfit. The past couple of years have been all about ombre whether it was hair color or regarding clothing. This ombre shirt comprising of shades of Blue and White makes for a great top for denim jeans. The blue boots finish off the look with perfection. Wearing a lighter denim wash is the key to wearing shades of blue. Since we just talked about shades of blue, let’s talk about doing Blue on Blue. We love it when Middle-Aged women opt for lighter toned skinny jeans that make them appear very delicate and elegant. Dobbie’s choice of fashion is inspirational and should be followed by all. The entire outfit from shirt, jeans and shoes comprise of shades of blue. Her ruffle sleeves are adding the right statement. Like we just said above, try wearing different tones of the same color to ace the look. This Denim Jumpsuit is a very different one and is nicely done with an overcoat. The hints of fur and animal print give the perfect Winter Vibes. Pull out your favorite denim jumpsuits and pair them with an overcoat for a stylish yet bundled look for the upcoming Winter Season. We love how Mel wraps her scarf to look like a neckerchief accessorizing it to perfection. Don’t miss out these 18 Elegant Work Wear Outfit Ideas for Women Over 50. Customized Shirts, Blazers and Jackets have been done, and now it is time for customizing jeans. After Mel’s Jumpsuit comes Sarah’s customized jeans that have just the right amount of color on them. She styles them effortlessly with a White T-Shirt and leopard print jacket. Bring your artistic side out and go for a DIY to brighten up your denim jeans. Blazers are not worn with jeans let alone distressed one’s since they are always put together with Dress Pants. Beth does it rightly with a Printed T-shirt and Distressed Jeans. Beth Djalali is inspirational when it comes to Fashion for women over 50. Her choice of accessories from Belt, Handbags, Bracelets and Long Necklaces is worthy of appreciation. The business casual Blazer has been nicely paired with a white top with hints of colors that she matches with her Belt and Handbag. This one is super comfortable and tomboyish. Long T-Shirts have been back in business ever since Kim Kardashian popularized them with Yeezy’s. Dorrie puts her best foot forward in a printed Oversized Tee paired with a very light denim wash, completing the look with some sneakers. While we had come to believe that accessories were a No-No with T-shirts, Dorrie makes us reconsider with her loops. As bizarre as it sounds, we are in love with how gorgeously the two are going together. Despite sequins being a thing reserved for formal wear, they have been worn with casuals for a fancier and funkier look. Mel Kobayashi does not need an excuse to pull out her sequins as she pairs them effortlessly with her denim Jumpsuit.